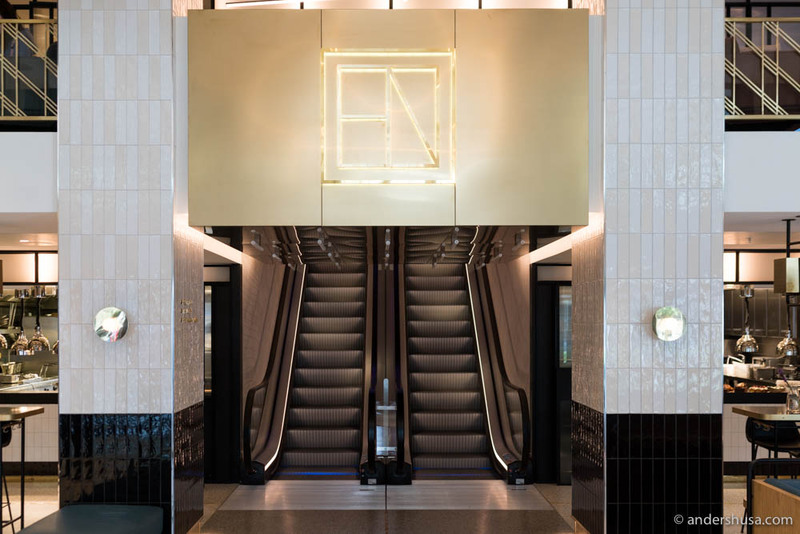 Norway has a new high-end hotel situated in our second capital – Bergen. 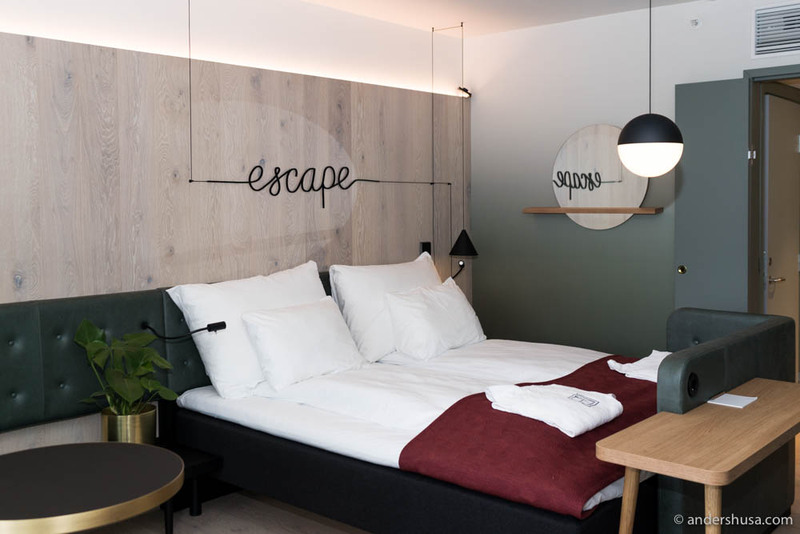 Hotel Norge by Scandic lies in the heart of the city, on Torvallmenningen, next to the popular meeting spot Den Blå Steinen, with a spectacular view towards Lille Lungegårdsvannet. This iconic hotel is not actually new, though. In fact, it dates back to 1885, but for the last two years, it has undergone heavy renovation. 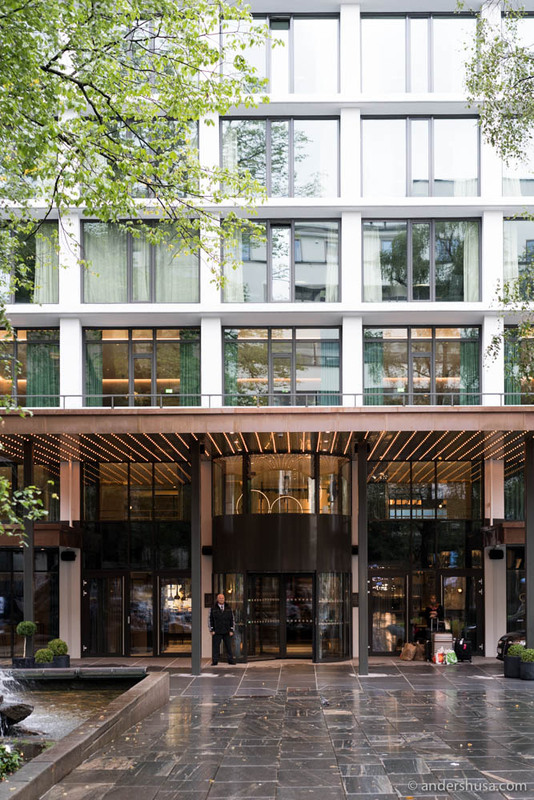 The hotel’s new and modern design is by one of the world’s leading interior architect companies – the well-known Concrete from the Netherlands. 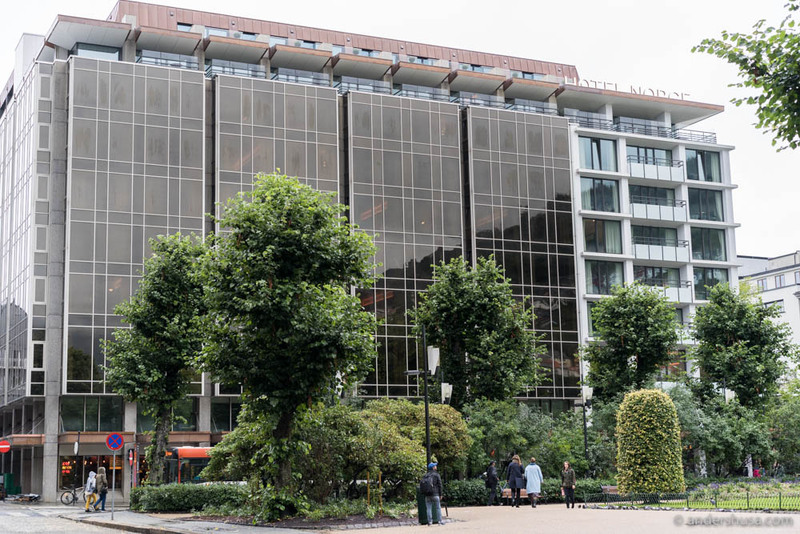 With a total of 415 rooms across ten floors, Hotel Norge is the largest provider of accommodations in Bergen. 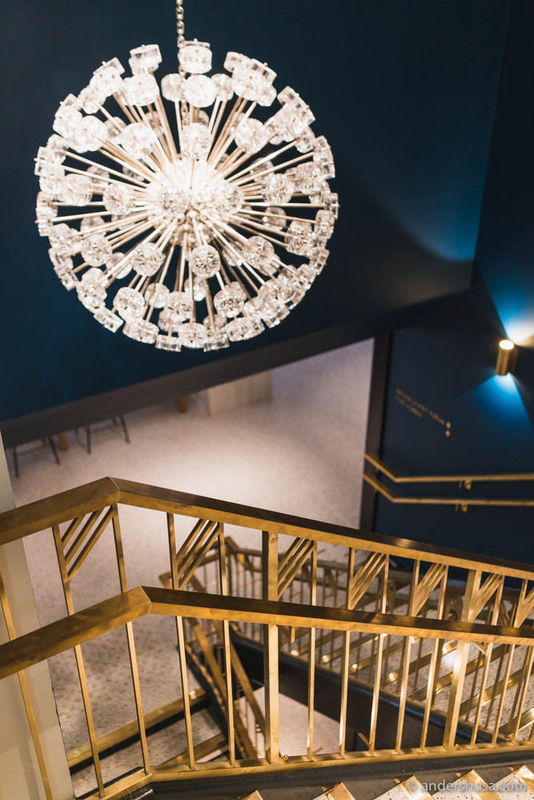 Ambitions seem sky-high, with an amazing eye to detail that is only matched by an exceptional service level, perhaps best illustrated by the dedicated guest relationship manager that will cater to guests every need. I can imagine that Hotel Norge will become to Bergen, what The Thief is to Oslo. 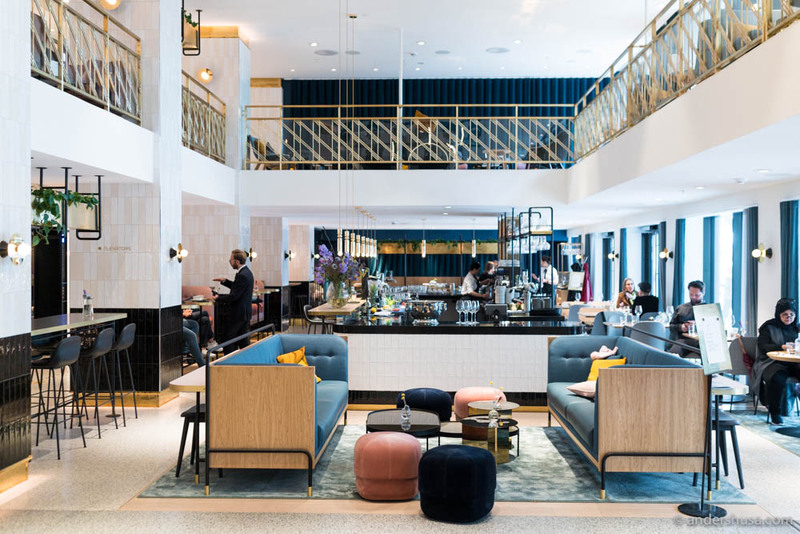 The opening of Hotel Norge, one of Scandic’s Signature hotels, was on June 29th, 2018, but the official opening party was not held until this weekend, on September 27th. However, it was back in August when I checked into a Grande Balcony room on the 9th floor. Floor-to-ceiling-windows and a balcony facing the water, with a separate bathroom and toilet, and a king-size bed were some of the key features of my room. There are more spectacular rooms, though, for those who are looking for that extra level of luxury. 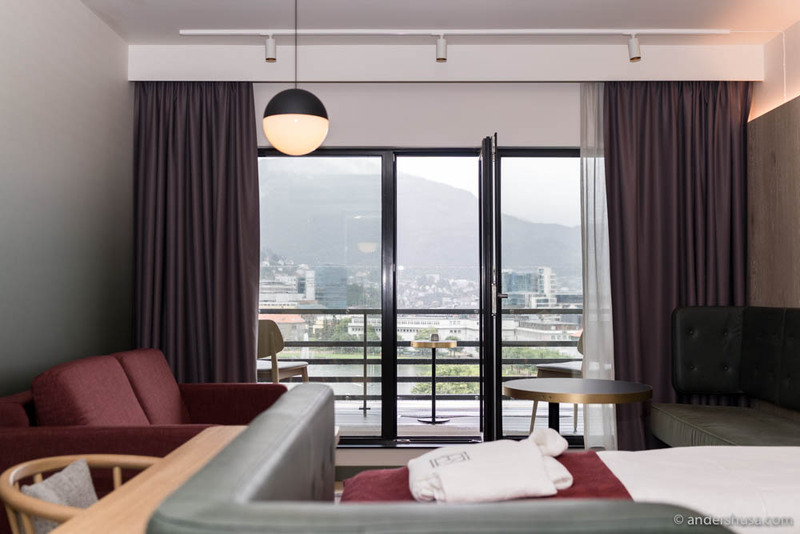 A total of 14 Junior suites, most of them on the 10th floor, two special Master suites, and The Hotel Norge Suite which comes complete with a private sauna and a Jacuzzi on the balcony. 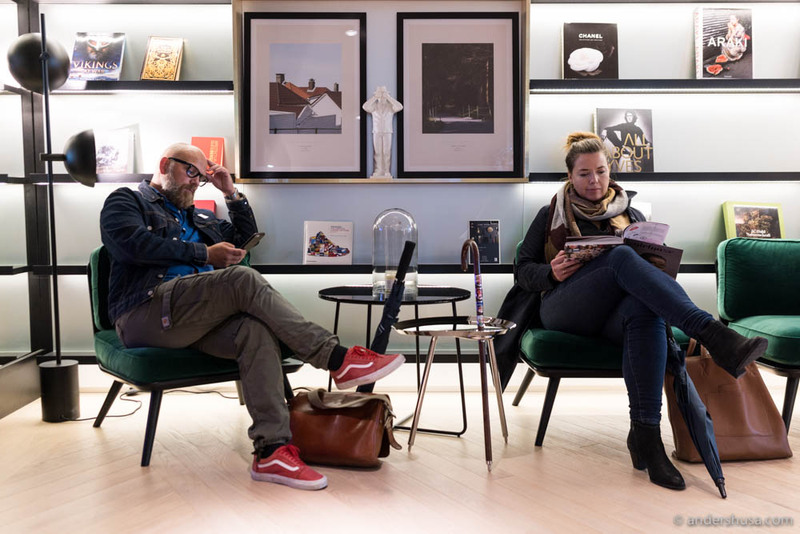 Hotel Norge aims to be a gathering spot for all of Bergen, not just its guests. That’s why you enter directly into their bar-, lounge-, and café area on the ground floor. 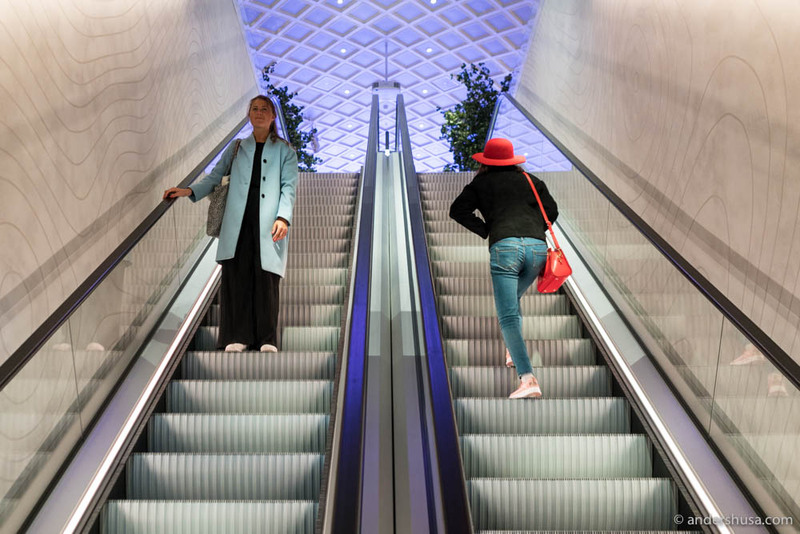 In order to get to the reception, you have to take the escalators (or elevator) to the third floor. And what a spectacular sight that awaits you at the top. 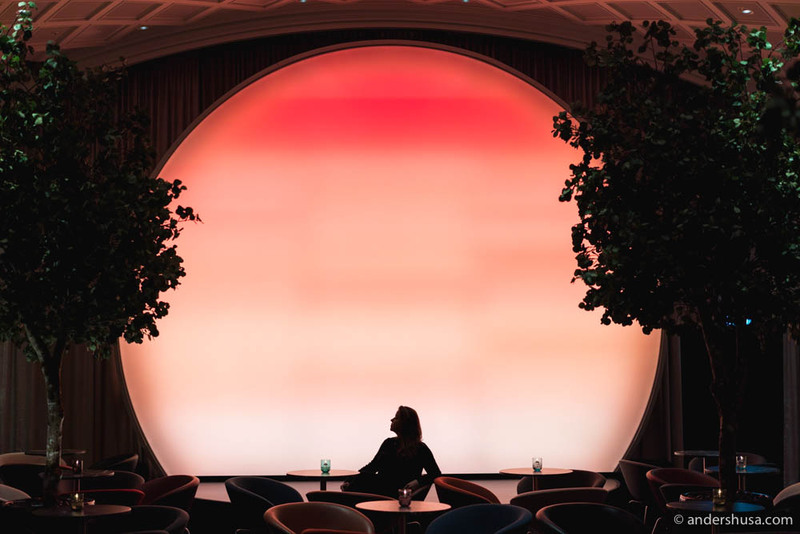 A gigantic backlit sun is shining bright towards you, with colors alternating throughout the day and night, giving the lobby a unique ambiance. To the right is the reception desk, and to the left, you find another cocktail bar, fittingly named The Lobby. 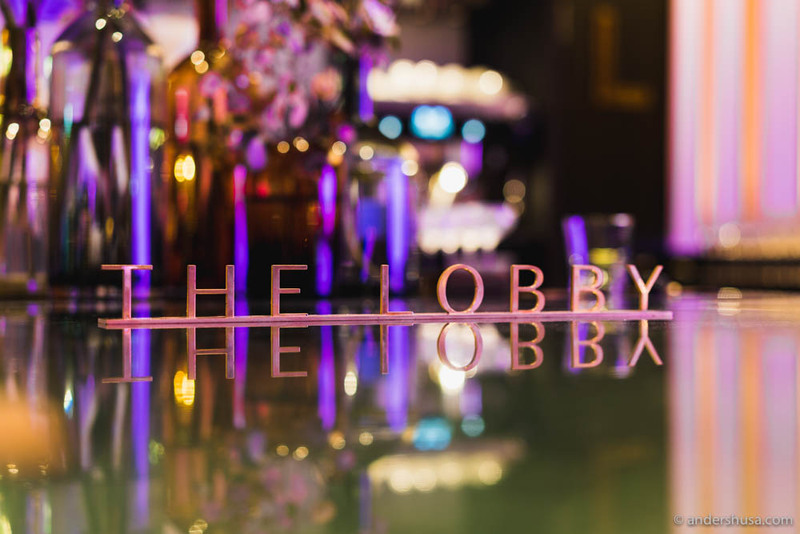 The Lobby is also where our meal started this evening. 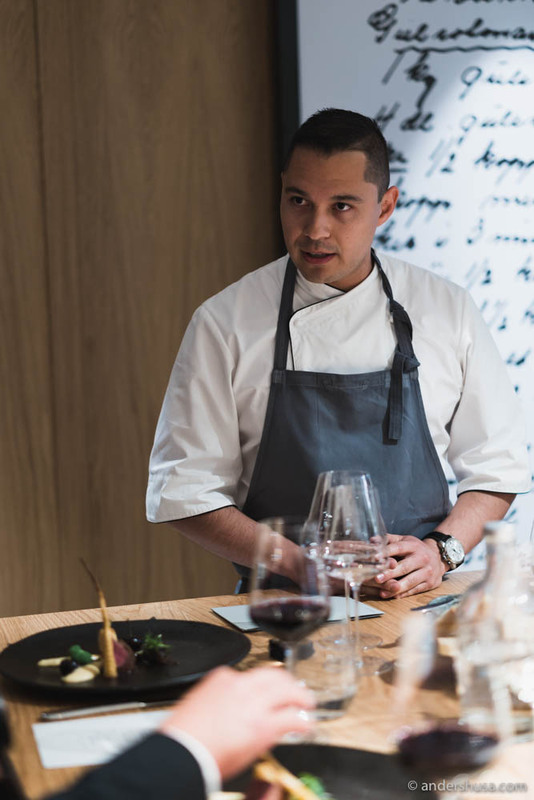 To celebrate the opening of the Chef’s Table concept of restaurant Nova, Scandic asked me to gather a group of food lovers that could give some feedback on the menu and experience. 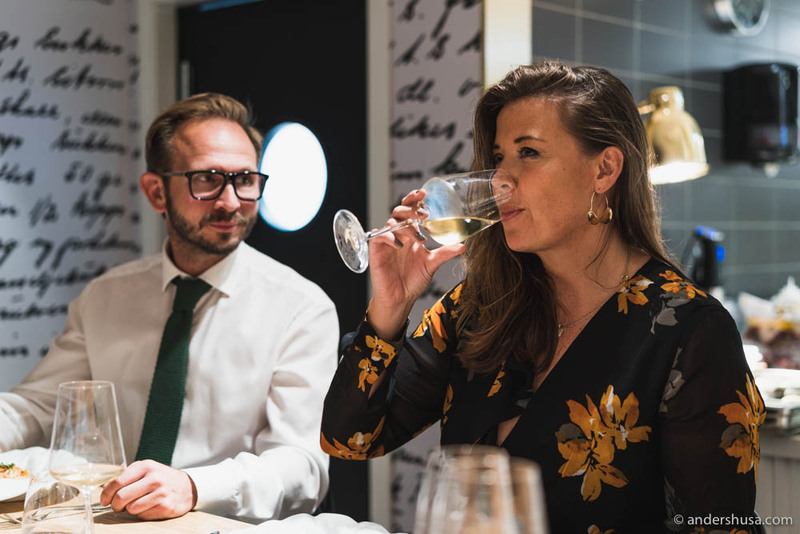 Some of Norway’s finest foodies attended, including Lars Fredriksen (Lars Spiser), Camilla Hellum (UrbaniaMagasinet), and Melissa Hegge. In addition, we had our lovely neighbors present, represented by Celine Fierro from StockholmFood – one of the largest and best food-related Instagram accounts in Sweden. 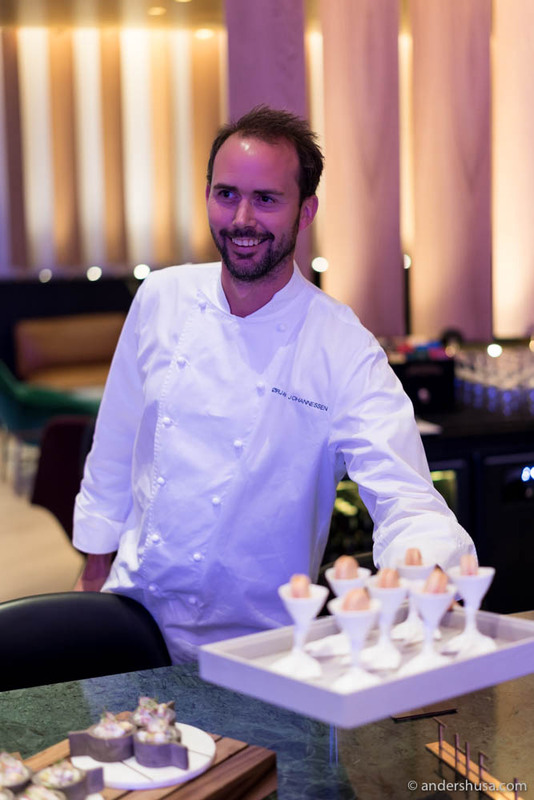 A bartender mixed up a refreshing welcome beverage, while Bocuse d’Or-winner and chef patron at Bekkjarvik Gjestgiveri, Ørjan Johannesen brought out the snacks. 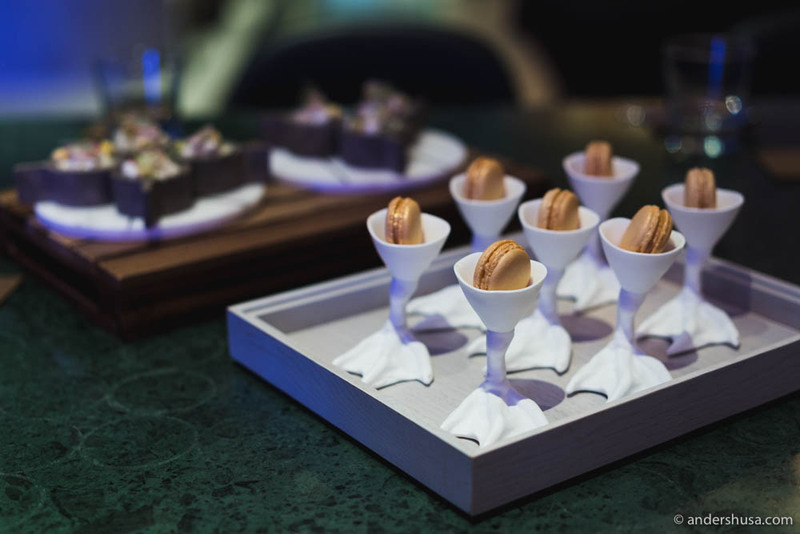 Gold-colored macarons filled with a savory chicken liver cream, a cold ceviche, and a warming fish soup. 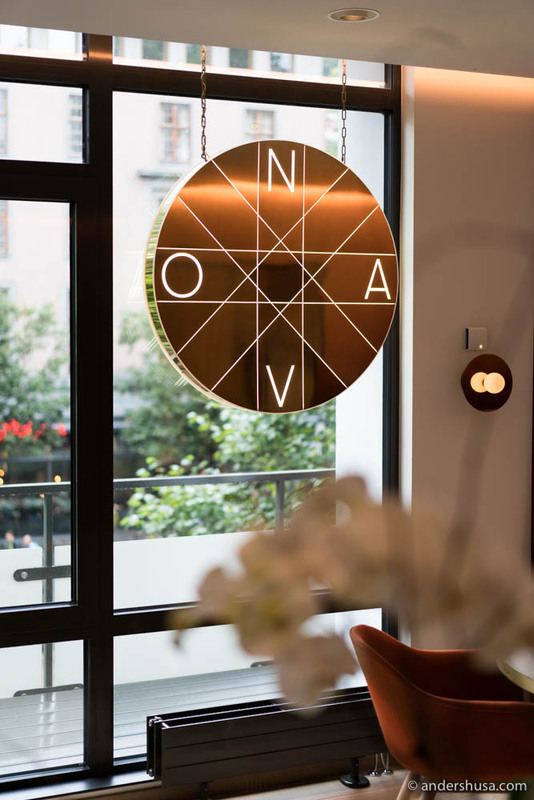 After these amuse bouches, we moved into restaurant Nova. 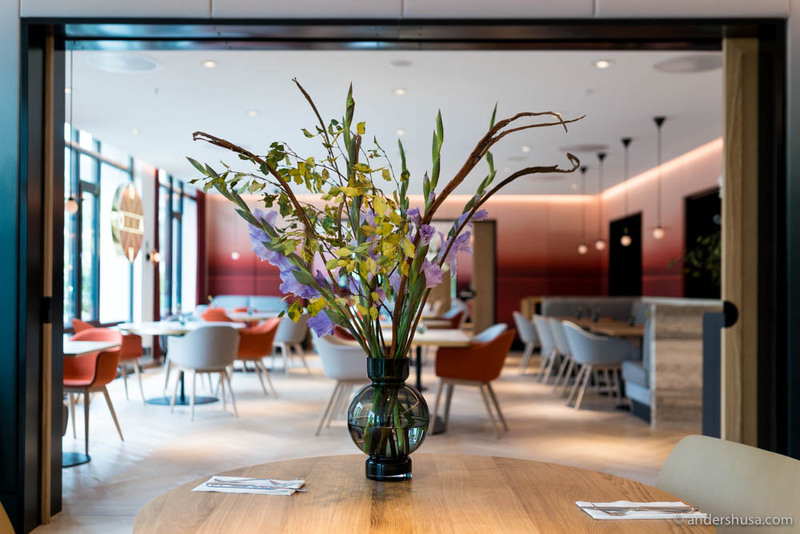 Hotel Norge’s restaurant is a Nordic brasserie with international influences, using local produce and flavors from around the world. 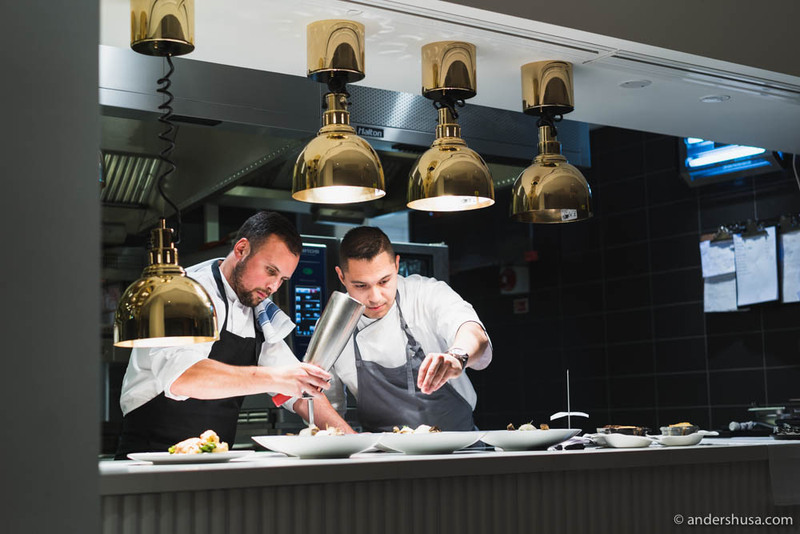 Tore Espenes is the head chef and Ørjan Johannesen acts as a sort of chef advisor and creative leader. 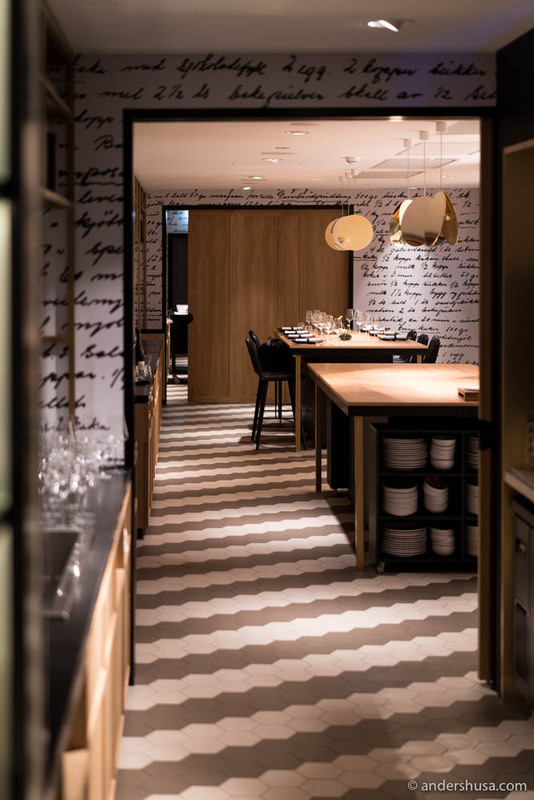 The Chef’s Table in restaurant Nova is an experience that can be booked by anyone. Two tables can fit a total of twelve people. The same menu can also be enjoyed in the main dining room, but only as à la carte (appetizers from NOK 155, mains from NOK 295). As guests at the chef’s table, you are seated directly in front of the kitchen, with first-row tickets to the show. It’s like a Chambre Séparée, but even more exclusive. Busy chefs in the pass could be seen plating the next dish already as we sat down. A dedicated sommelier filled our glasses with something of the sparkling kind and gave us the producer’s background story. 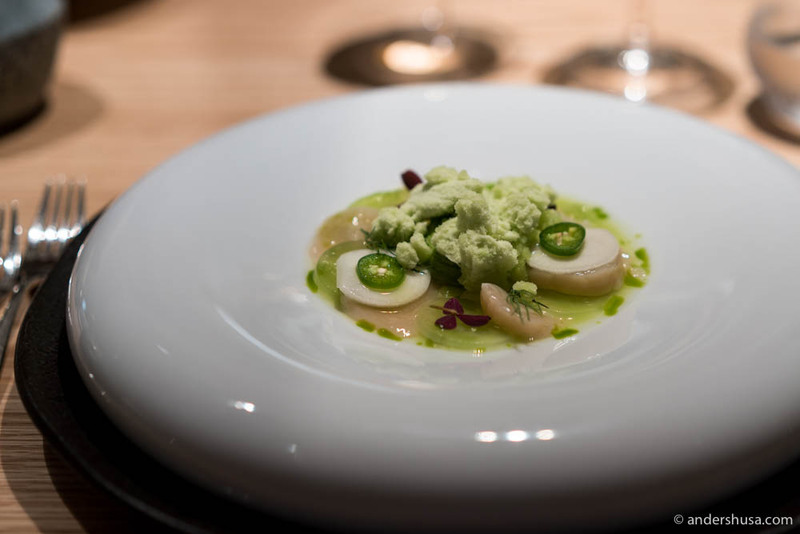 A starter of raw-marinated scallops came with avocado, pickled kohlrabi, cucumber & cucumber granita. Ice cold ingredients that gave the sensation of eating the fresh clams straight out of the ocean. A few slices of jalapeño added some spice to the dish. 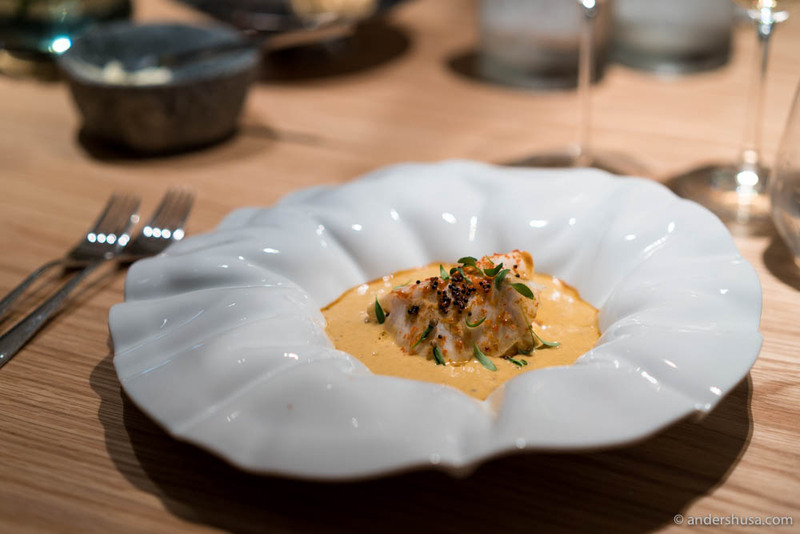 From elegant and refreshingly Nordic we moved quickly over to a more pungent serving of butter-fried lobster in a rich lobster bisque, with pickled celeriac and a curry foam. Clearly, a kitchen that is not afraid to mix in flavors from different countries in one dish. 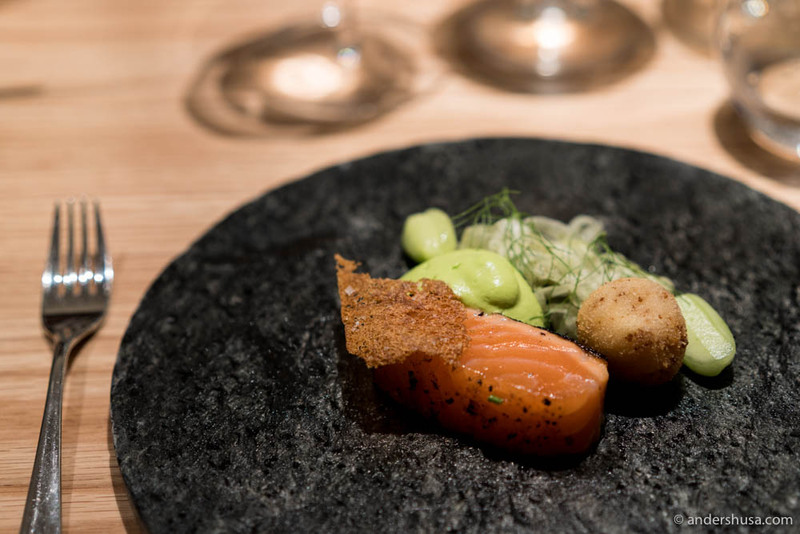 The most forgettable dish of the meal was a wild salmon with dill espuma, fennel, and rye. Much more interesting was the Arctic char with artichoke sauce, white asparagus, løyrom, and a poached egg, although it could need a better presentation (not even pictured here). Creamy, salty, and delicious flavors made it a joy to consume, though. 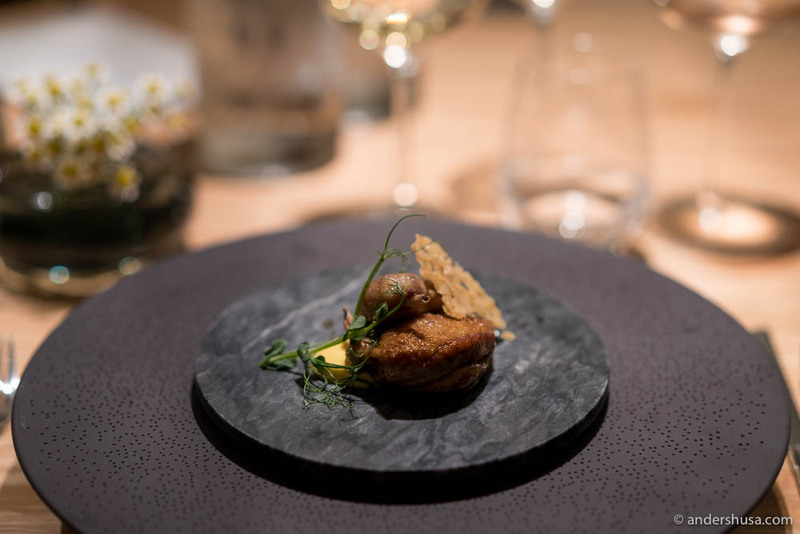 Moving to darker meats, we got a small piece of quail from Tysvær, both the leg and breast, with a crispy chip of the skin. Hiding underneath the plate was a ceps risotto with peas and ceps Hollandaise. 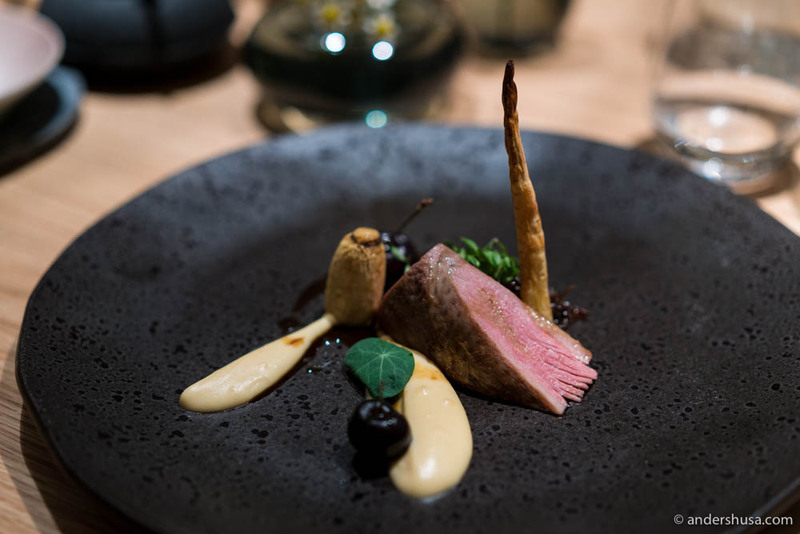 Finally, duck was the main course, also this came as a combination of both the smoked breast and confit leg. Parsley roots in variations (seared and puréed), seasonal morello cherries, and a tasty sauce made on the duck matched well. Perhaps the highlight of the meal for me was the dessert. 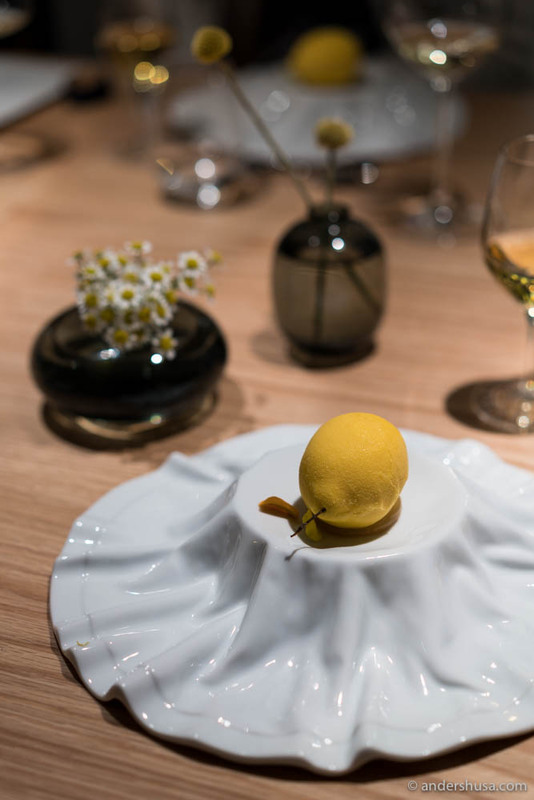 A Cédric Groulet-inspired serving of lemon and yuzu mousse. 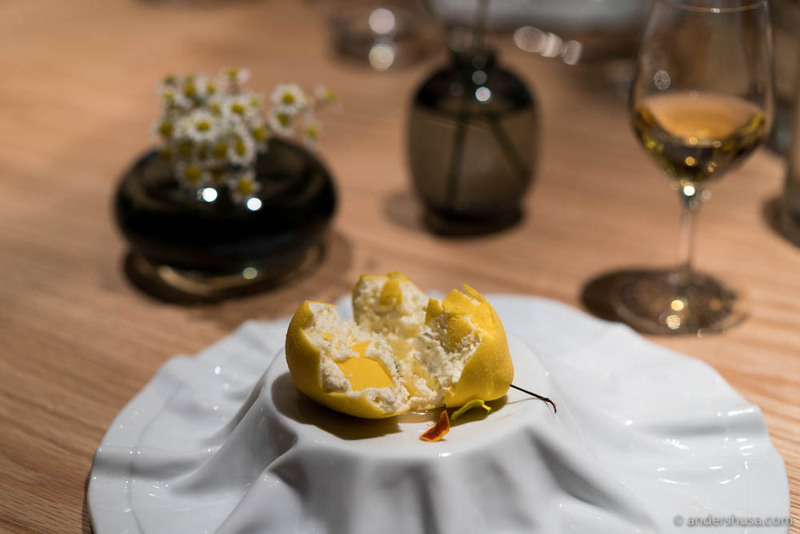 If you don’t know who Groulet is, he was named the best pastry chef in the world by the World’s 50 Best in Bilbao this year. This creation is so impressing, and I’ve YouTubed how to make it, so I know how time-consuming it is too. Basically, a hard shell of white chocolate is hiding a soft citrus mousse inside. You crack the thing open with your spoon and enjoy. Hours to make, seconds to destroy. That’s food art for you. 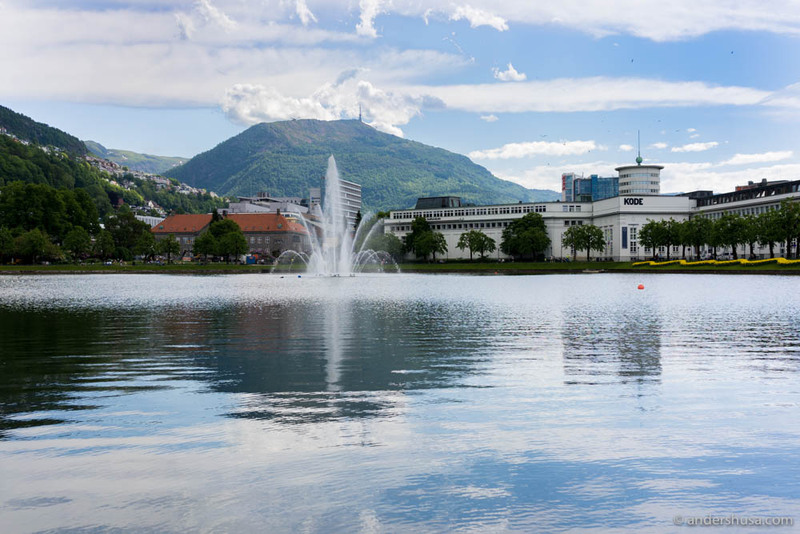 Have you stayed at Hotel Norge in Bergen or dined in restaurant Nova? Please share your experience in a comment below.